This month at Rising Phoenix Martial Arts & Fitness, the school will be focusing on a very powerful word…courtesy. 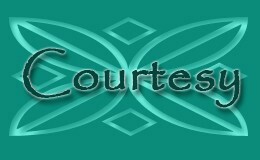 Oftentimes, people refer to courtesy as simply a way to be polite, however there is so much more to this powerful word. People who show courtesy are thoughtful and think before they act. It’s about demonstrating empathy, showing kindness and having respect for others. It is important for the Martial Arts Instructors, parents, scout leaders, teachers and mentors to help children understand the importance of courtesy as well as when to demonstrate or have courtesy. Whether they’re at home at the dinner table, with friends on the playground negotiating activities and interests or with people in our community whom they don’t personally know, having a good understanding of courtesy will serve our children well. Over the course of the entire month, Rising Phoenix will be touching upon these great aspects of courtesy as well as others. Along with teaching their students these topics in their martial arts classes, they also work hand-in-hand with parents to cover some difficult and sometimes overlooked topics. They will also help parents to incorporate the three following tips to help instill courtesy in their children. 1. Taking the extra moment to teach your child: When your child does not remember to use manners, hold the door to help others, it’s important to not jump in and ‘rescue’ them and do it for them. Instead, take the moment to politely ask them to do what the courteous thing would be. A great example of this is, “Would you mind holding that door for the mother pushing her baby in the stroller?” This opens up great dialogue with your children to emphasize that it was a nice thing to do and something that we would appreciate if others did for us. 2. Expect courteous actions: Whether at the dinner table, walking into a store, taking the groceries into the house or interacting with friends and family, expect your children to show courteous, developmentally appropriate behavior. Expect table manners, holding the door for others and lending a helping hand. When we expect kind behavior and relay this to our children, they are much more likely to show it. 3. Provide courteous opportunities: When you see an opportunity to lend a helping hand or overtly use manners, take it! Say to your children; “that elderly woman is struggling with her bags and getting out the door– what do you think we should do?” Allow them to hear the courteous way you order from a restaurant and ask them to shadow you by ordering in the same way after you. There are opportunities everywhere for us to create teaching moments in our children’s lives. Sometimes, we get caught up in our hectic schedules and forget to carve out the simple little 30 seconds to help our children see what courtesy or any other awesome character trait we want to see in them. If we as mentors and guides to our children can remember to do a single character building thing each day with our children, imagine how AWESOME our next generation of leaders will become. If you have any questions about how to instill life-long character building exercises and traits into your children, call or email Master David Ferwerda, Owner of Rising Phoenix Martial Arts & Fitness at 201-644-7300 & RisingPhoenixMAF@gmail.com.